Taiwan Food preservation - sodium metabisulfite | CATHAY CHEMICAL WORKS, INC. The substance sometimes referred to as disodium metabisulfite. It used as a disinfectant, antioxidant, and it chemical preservatives for food preservation. Sodium Metabisulfite is free flowing dry white uniformly crystalline powder. It's solution is called sodium acid sulfite or sodium bisulfite. It is also named sodium pyrosulfite. 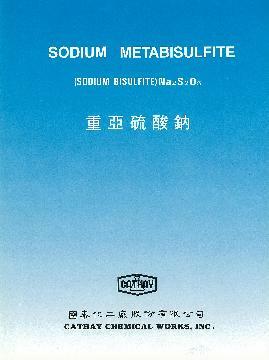 Sodium Metabisulfite is a convenient source of sulfur dioxide and widely used for a variety of applications. - Sodium Metabisulfite is widely used as an Anti-chlor in textile industry and as a bleaching agent in the preparation of wood pulp. - It can be used for preserving foodstuffs, as a preservative in manufacture of silage. - In photography it is used as reducing agent of developing. - In organic chemistry it is also used for manufacture of acrylic fibres, and in production of viscose rayon. - It confers additional water solubility on dyestuff in the manufacture of certain dyestuffs. - In food industry it is used as a preservative agent. - It is used in tanning industry and pharmacy industry. - It is ued for water treatment. - Also it is used for raw rubber production from latex. Dye industry - sodium h.. Non nano & microniz Zin..